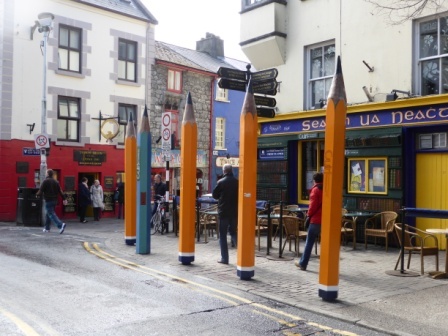 My excursion to Cúirt this year, the annual Galway literary festival, was as much about music as it was about literature. The program has always contained some elements of music but it seemed to play a larger role this year. Books and music are my greatest loves (I’m still waiting for the third, that knight in shining armor to come riding in). 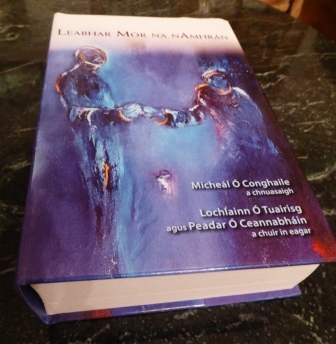 Leabhar Mór na nAmhrán is exactly what it says on the tin – the big (very big) book of Irish song lyrics. It’s a must-have for the Séan-Nós lover, containing lyrics to over 400 songs. Irish music, sung in the native language was the kindling for my love affair with Ireland, so the launch of this book was a must-see for me. Despite the majority of the event being spoken or sung in Irish (mo chuid Gaeilge bocht, fós), I was able to catch quite a few bits and pieces. These experiences always make me want to work harder on my Irish – it’s just a matter of finding/making the time. 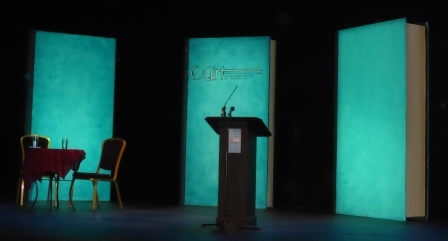 The performers were Lilis O’Laoire, Peadar O’ Ceannabháin and Eilís Ní Shúillebháin. The first two I had seen on one or more occasions in the Tunes in the Church concerts and they are truly accomplished singers, but it was my first time hearing Eilís who has a lovely, soft voice. Soft is a tricky word to use when describing a singer, but in this case it wasn’t the volume that I was referring to but the tone. The best way I know how to describe it is soft around the edges – bhí sí go hálainn. Among the other events I attended was a reading and talk with Joanne Harris – probably best known for her book Chocolat (though she does have 17 other published books to her name). She is a very engaging speaker and had the audience laughing frequently. To paraphrase one of her comments that seemed especially poignant – ‘the line between being a writer and having a mental illness is thin.’ I would think this is especially true for fiction writers who spend so much time in ‘other worlds’ with characters that you develop a close friendship with or even become your foes. It’s like being a child again where we are allowed to have imaginary friends! One of my writing mentors, Kevin Higgins, launched his new poetry collection called The Ghost in the Lobby at the festival. If you like you poetry with a scoop of satire and a sprinkling of humor, you’ll love Kevin’s poetry. He has a way of holding a mirror up to society and current events, and you may not always like what you see, but there is more than a hint of truth in that reflection. Another interesting event that blended music with literature was called The Music Bookclub. 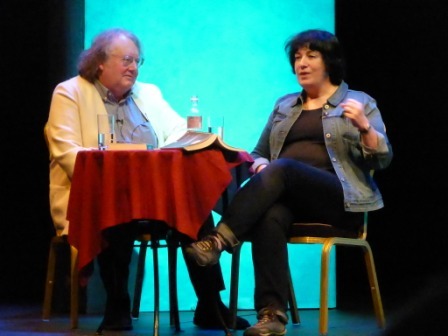 Hosted by Jim Carroll, it included Maria Doyle Kennedy (singer/actor/filmmaker), Adrian Crowley (singer/lyricist/author), and Níal Conlon (musician/writer/script editor). 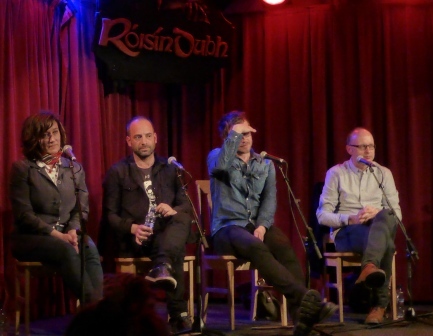 While the focus was on what books or type of books musicians read (they spend a good amount of time traveling and many are quite avid readers), it took what I thought was an interesting turn during the Q&A when a person from the audience asked whether these songwriters considered themselves poets. All three responded with a resounding no, implying an almost adage that poets are somehow more literary than songwriters. It shocked me that not one considered themselves a poet. What is a song, if not poetry combined with music? There are artists like Loreena McKennitt who have taken well known poems and set them to music, but just because the verses were written and published before the music was added, doesn’t make them any more lofty or “literary” than poetry expressly written to be performed with musical accompaniment. We all have at least one it not many songs stamped into our hearts and minds that have touched us as deeply as anything we may have read on the printed page. As with any art form, there are people who will love a song/poem and others not so much. I, myself have a love/hate relationship with printed poetry which, when I think about it, could apply to songs as well – some are funny and entertaining, some thought provoking, some pluck at my heart strings, and some I just don’t understand at all. I would say to these and all song writers – never sell yourselves short. You are poets! And we thank you for practicing your craft as much as we do other poets and authors.